In last month’s article I wrote about autumn migration and it wasn’t my intention to mention it again this month, but in the middle of September a bird that shouldn’t be here turned up at the salt lagoons of San Pedro del Pinatar. During migration time, there are examples of migrant birds getting lost, being blown off course or taking strange routes whilst migrating. In this case our rare visitor was a bird that the average person has probably never heard of, a Red-Necked Phalarope pronounced fa-la-rope (Falaropo Picofino). Red-Necked Phalaropes are small, elegant waders that have lobed toes and are excellent swimmers. 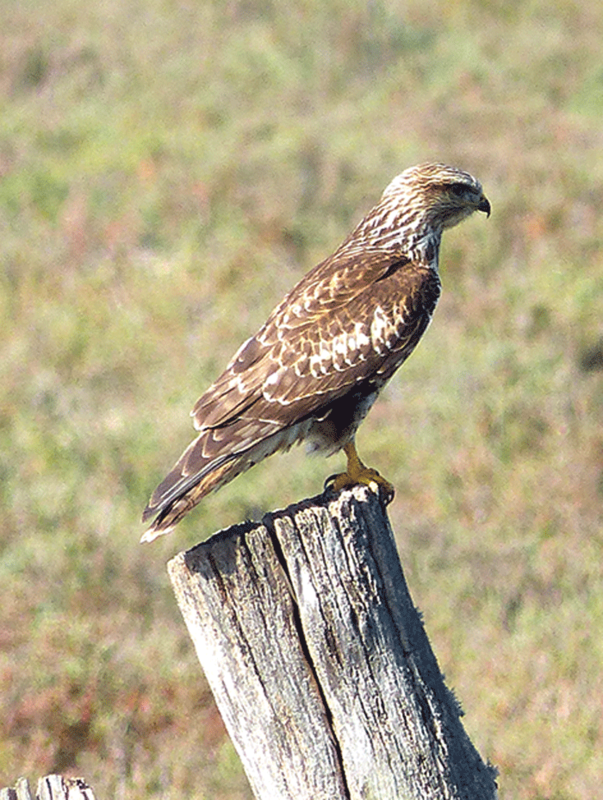 They are about 7-7.5 inches long with a long slender bill and they are about the size of a Starling. In summer plumage they are predominantly dark grey above, with a chestnut (red) neck and upper breast, black face and white throat and different from most birds, the breeding male is a duller version of the female. The winter plumage is quite different; the birds are basically a light grey above and white below with a noticeable black eye patch. 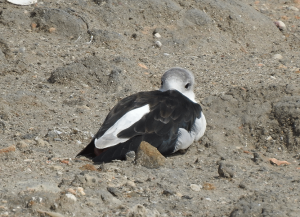 I think that the bird I saw in the salt pans was probably a juvenile in its first winter plumage as it had darker markings on the back and a noticeably full dark cap. However, it isn’t a species that I am very familiar with so it is just a personal opinion. They breed on wet marshes and pools across all of the arctic regions including Canada, Iceland, Greenland as well as the European, Russian and Siberian zones. It is also a rarish breeder in the northernmost parts of Scotland, especially the Shetland Isles. 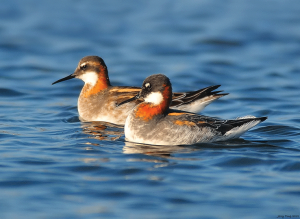 Their breeding behaviour is different from most birds as the traditional roles are reversed in all 3 Phalarope species. The breeding females are larger and more brightly coloured, pursue and fight over males and will defend their mate from other females until the clutch is complete and the male begins incubation. The males perform all the incubation and chick-rearing activities, while the females may attempt to find another mate. If a male loses the eggs to predation, he may re-pair with his original mate or a new female to try again. The North American Phalaropes overwinter mainly in the Humboldt current of South America, but the European and West Siberian populations migrate overland via the Caspian Sea and Kazakhstan lakes to spend the winter in the Arabian Sea. It is very unusual to find one here in Murcia at San Pedro del Pinatar which is considerably off-route from a normal flight path. 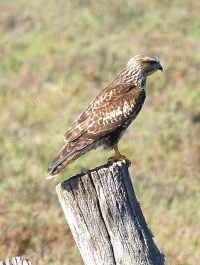 However, occasional birds turn up from time to time along the eastern coast of Spain in the Ebro Delta, Valencia, Santa Pola marshes and San Pedro. I am aware that there has been the odd bird seen briefly in Murcia during the last decade, but generally they have moved on overnight or stayed very briefly. In contrast, this bird stayed for over a week and was seen by quite a number of birders. As its presence coincided with stormy weather, I wonder if it stayed longer than normal waiting for the right weather conditions before pursuing its onward journey to the Arabian Sea. If this Phalarope arrives safely at its winter destination it will spend these months well away from land, living on the high seas with all the prevailing weather conditions. It will then return to its Arctic breeding grounds and just may come back to see us again next year in San Pedro del Pinatar. 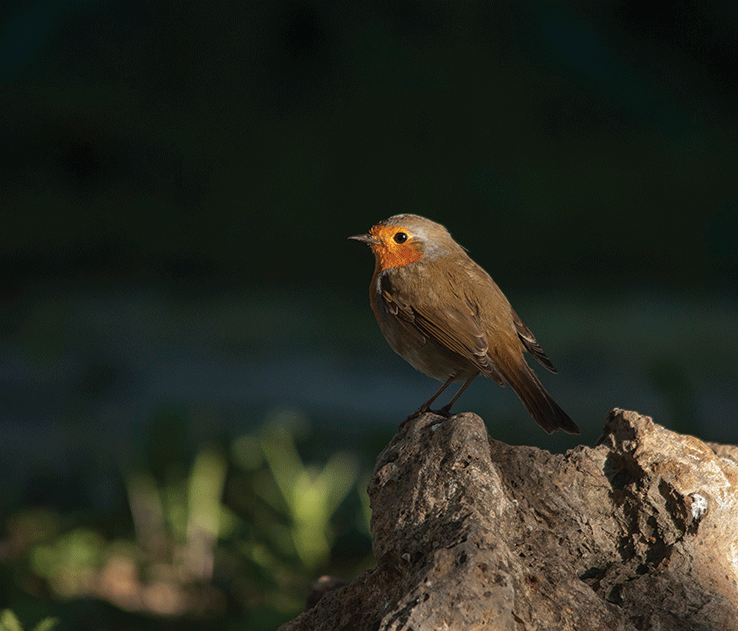 It may be a small and delicate bird, but it is clearly pretty tough to live as it does it is quite extraordinary. Besides seeing this rarity in the Salinas it was also a great opportunity to try out my new camera, a rather special birthday present from my wife. I have never been that interested in photography, but reading all the chats in a local birding group I had been encouraged by talk of a good and not too heavy bridge camera with a zoom lens up to x 83. A bridge camera is basically a half-way house between a simple point and shoot camera and a SLR that all the professionals use. Well, that got me thinking that even I could take some reasonable bird photos and my wife splashed out and bought me the very model that most of the chats had recommended. I must have been good recently! So, what did I find in my viewfinder? 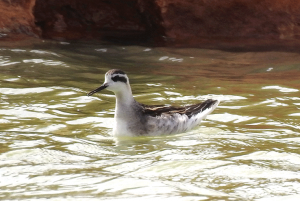 Firstly, the Red-Necked Phalarope (juvenile or non-breeding plumage)! Not a bad way to start! However, in comparison with the more professional shots of them in their colourful breeding plumage it seems there is still much to learn! Secondly, a wader that is ever present at this time of year, the Sanderling (Correlimos Tridáctilo) and a very obliging example allowed me to take some reasonable shots. 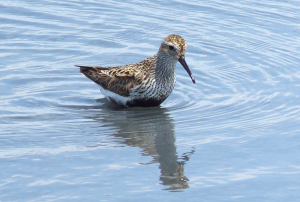 It is a small wader that is 7-8 inches long with black legs and a relatively stout, straight black beak. It is generally seen here in winter plumage on its return from breeding in the high Arctic. It is light grey on the upper parts and white below, which can make them appear ghost-like in poor light. However, in the bright sunshine of Murcia, you can see them quite clearly as they run actively along the water’s edge looking for small insects. 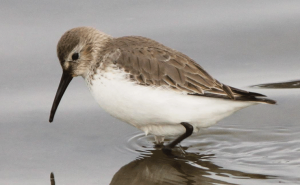 If you wish to familiarise yourself with wading birds, this wader is a good place to start as it is one of the easier and more common species of this group. Once you have learned to identify this species you can use it as a comparison for some of the others. The next wader to find itself in my viewfinder was a Dunlin (Correlimos Común) which you can see quite readily at the Salinas outside the breeding season. 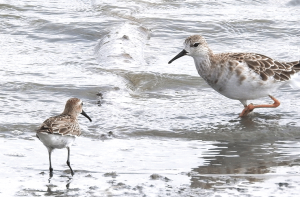 It is more or less the same size as the Sanderling, so these 2 birds can be easily confused if you are a beginner. The one photograph shows an individual that is still showing most of its breeding plumage which makes identification so much easier as it has a very noticeable black belly with rufous upper parts. Also, if you have good views and binoculars, look at the beak as it is considerably longer and generally down-curved at the end. 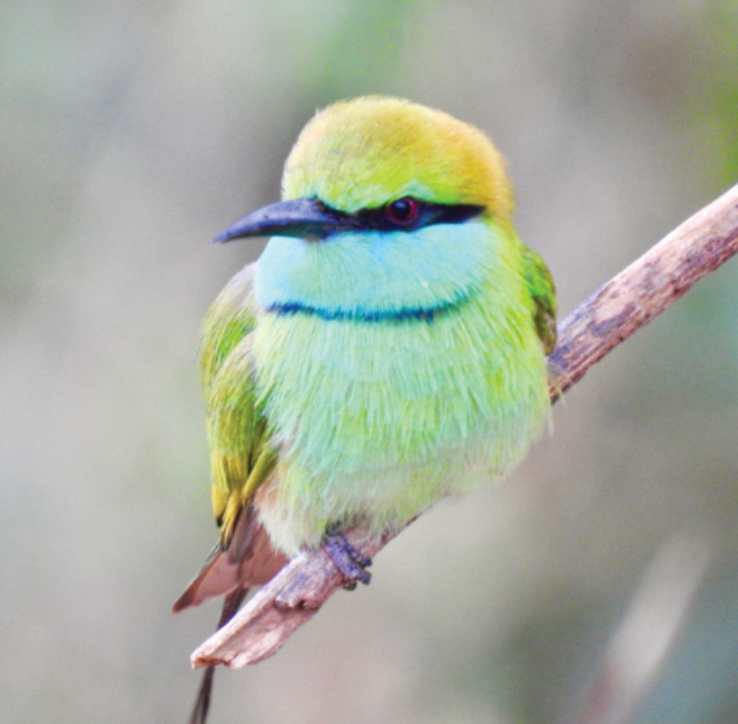 However, individuals do tend to vary a bit with some having very pronounced down-curved beaks and others less so. 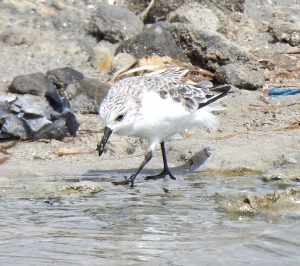 Although they can be quite active feeders, they are generally not quite so frantic in their movements as their close relative the Sanderling. However, in winter plumage they are a bit more tricky to identify as they tend be a dull brown above with a brown head and white below and appear a bit featureless. I have also written about these 2 species of waders in a previous article, but I make no apology for repeating them as getting to know these 2 is the key to small wader ID. If you know these 2, you should notice if any other small waders you are seeing are different. A lot of identification of difficult species can be a question of eliminating what it isn’t. Whilst on the subject of wader identification, remember size is important! I have included one of the photos I took on the same day which shows a Dunlin that has nearly moulted into winter plumage, along with another bird that is clearly bigger. Besides the size difference, look at the colour of the legs and the relative length of the beak on the larger bird that are clues to help you identify it in your bird guide. 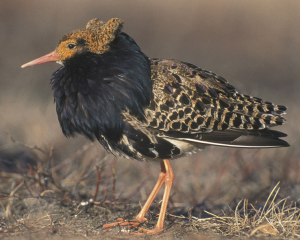 In this case our new bird is a Ruff (Combatiente) and they are quite often seen here out of the breeding season. 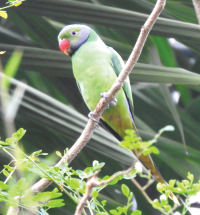 The males are very spectacular in their variable breeding plumage, especially when they display in communal leks looking to impress the watching females. Their common name derives from the feathers around the neck and chest which resembles the exaggerated collar that was fashionable neck-wear from the mid-sixteenth to the mid-seventeenth century. Finally, to prove that not all waders are difficult to identify I am including a couple of photos of Black Winged Stilts (Cigüeñuela); one wading and the other resting on a sandbank. 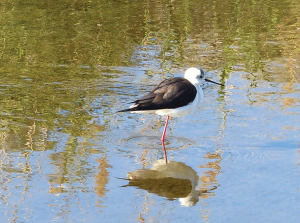 These birds can be seen here all year round and are very noticeable with their long delicate red legs, black and white colouration and long stiletto shaped beak.